My Occasional Blog: Long Live The King! 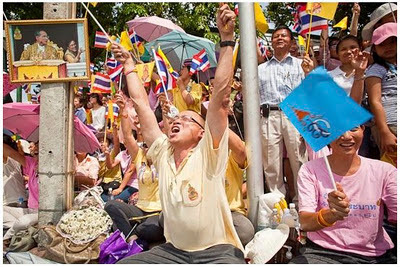 A man leads a cheer for the Thai King while he and others wait for the King to pass them on Coronation Day in Bangkok Wednesday. The Thai Monarch, King Bhumibol Adulyadej, was crowned on May 5, 1950. Today is the 60th anniversary of his coronation. He is the longest serving Monarch in Thai history and the longest serving contemporary head of state in the world. The Thais absolutely revere their King. He is the one thing this fractured nation agrees on. It’s hard for a westerner to grasp his role in Thai society. He is not revered in the same way that the great God Kings of Angkor or Ayutthaya were. He is revered because he is not a God King. He is a mortal who puts his people’s needs ahead of his own. He’s sponsored economic development programs in the impoverished rural parts of Thailand. He funds schools and colleges, hospitals and health programs. He is an accomplished jazz musician and amateur photographer. When the Thai military opened fire on student protestors in the 1970’s, the King opened the gates of his residential palace and sheltered the students. I find it interesting that as he ages, his photos age, unlike more vain world leaders, who are fading into their sunset years, yet their portraits seem to have been taken when they were in the prime of life. The portraits you see of the King are not some strapping 30 year old (though there are a few of those around still). They’re photos of a man who looks to be in his late 70’s or early 80’s. (The King is currently 82 and in fragile health.) One of the most popular photos of the King was taken when he was in a rural village and has a rather large drop of sweat hanging off his nose. Thais love it because they think it shows the true character of their monarch. People sit outside and wait for hours to see the King and his motorcade pass on Coronation Day, an event that lasts about two minutes. Bangkok in May is hot. Really hot. And it’s been raining very heavily for the last two days. But today the sky was clear and it was, by Bangkok standards, quite nice out. A perfect day to wait for the Monarch. There are more photos of the crowds waiting for the King in my PhotoShelter archive and available from ZUMA Press.